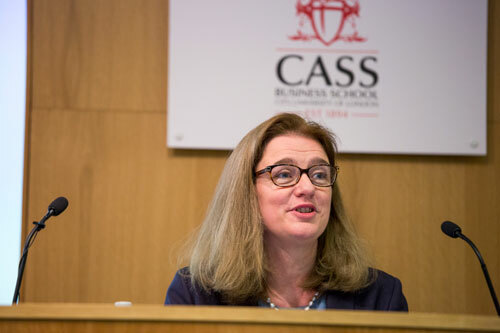 Former Education Secretary and St Mary’s University Pro Vice-Chancellor, the Rt Hon Ruth Kelly has delivered the 11th Sir John Cass Foundation Lecture at Cass Business School. Ms Kelly’s lecture was entitled Education and its impact on the life chances of children in care. Delivered during National Care Leavers’ Week, Ms Kelly’s lecture discussed The First Star Academy programme - a pioneering educational programme funded by the Sir John Cass’s Foundation with a £400,000 grant and recently launched at St Mary’s University, Twickenham, as a means of tackling what has come to be seen as “the virtually intractable problem” of improving outcomes for children in care. The First Star Academy programme provides a new approach to addressing the personal and academic development of the 72,000 looked-after children across the country. St Mary’s is the first UK university to take up First Star and adapt the four-year scheme initiated in the USA by film producer, Peter Samuelson, to meet the academic and emotional needs of children in care. The Academy will see 30 young people (aged 14-18) currently living in foster care or children’s homes in London boroughs – including Richmond, Hounslow, Southwark, Ealing, Kingston and Wandsworth – spend four residential summers and monthly sessions during term-time on St Mary’s University campus to receive academic tutoring, life skills training, emotional support and experience of campus life, with the joint objectives of helping them to sustain their academic progress and succeed in their exams, and also raising their aspirations to access college or university. The Academy also offers a programme of support for foster parents aimed at reducing the chances of foster placement breakdown. The audience also heard a moving first person testimony from Ms Kerry Littleford, who spent her teenage years in care and has eight younger siblings who also went into care. Kerry now works to alleviate social and health inequalities in Hackney and has begun storytelling as a way to share her experiences. Ms Littleford recently shared her stories at Battersea Arts Centre, on BBC Radio 4’s Four Thought Programme and in a recent feature in the Guardian. “The core vision of Sir John Cass’s Foundation is to contribute to educational policy, practice and research in order to shape and meet the evolving needs of London’s young people. I can think of no area more deserving of attention than the educational needs of young people in London who are in care. “This is an important and timely topic, with recent statistics from the Department for Education showing that 90 young people enter the care system each day in England and Wales. The 2018 Sir John Cass Foundation Lecture will be delivered by Professor Frances Corner OBE, Pro Vice-Chancellor Digital and Head of the London College of Fashion. The First Star Academy at St Mary’s University, Twickenham, is funded by the Sir John Cass’s Foundation, the Cundhill Foundation, the MariaMarina Foundation and several individual donors.